What about some Quests @NoNameCon Villages? Think you can achieve much with your laptop? Come and prove it! This baby was not pwnd @ OWASP Lviv Meetup, hope engine will be started by you! Try harder to enable hidden functions! Closer you are – more control over the car features you have. Hardware equipment and software for hacking connected car mobile application is prepared by CyberSecurity geek, passioned about hacking, electronics and microprogramming Yuriy Bilyk, engineer passioned about CyberSecurity Bohdan Serednytskyi and CyberSecurity engineer and geek Igor Beliaiev. DVAR is an emulated Linux based ARM router running a vulnerable web server that you can sharpen your ARM stack overflow skills with. 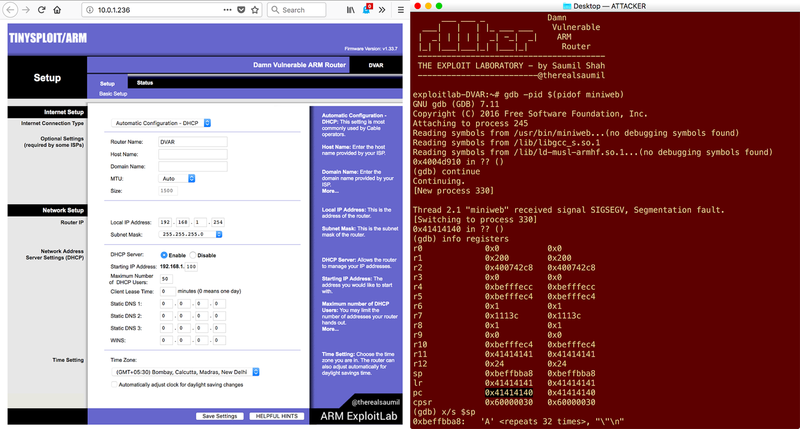 Your goal is to write a working stack overflow exploit for the web server running on the DVAR tinysploit ARM target. How to control your car programmatically? OBD-II for dummiez, we will get couple layers deeper! Demonstration of direct access to internal ECU via CAN bus. Cheap interface hardware and free Kali Linux are key components everyone can afford to repeat demo on practice by themselves. Fans of CAN bus hacking, you will be surprised, so BYOD for more fun and experience! Still think that your apartments are safe when you leave? What about equipment your company bought and store at warehouse behind that huge lock? Come to our experienced and enthusiastic professional, he will show and teach you how locks can be unlocked. Moreover you will be able to get free consultancy how to select proper locks in order to sleep well after practice you seen. Different types of locks, security pins, lockpicks, practical challenges and prizes. We have nothing more to add up here. You know what it is, come over and meditate over a task or two. Village will be conducted by enthusiastic self-taught professional with wide experience in the field Alex Shmelev and Anonymous guests. Understanding the features of two-factor authentication: one-time passwords generating algorithms, advantages and disadvantages of different types of tokens, what can be protected by MFA, and what can not, answers to questions and much more. Bohdan Rezanov - likes to find hidden opportunities both in information systems and in real life. Responsible for the integration of Protectimus with third-party services. He will explain in details how to make your infrastructure MFA-friendly. Denys Shokotko - responsible for technical development and the presence of extra cool features in the system, likes tokens and cycling. Will describe the features of OTP generation algorithms and about the development of two-factor authentication systems in Ukraine. Maxim Oliinik, co-founder and CEO of Protectimus, pass the way from developer and administrator to the Head of the Company. He will closely monitor that these two above mentioned behave well. In modern world amount of Wireless traffic exceeding Ethernet, so is it possible to pass near Wi-Fi and do not play with it? Sure "No way!!!!" for our format! footer.php или /etc/passwd, зовут вас "Max" или "><script>alert()</script>. потенциального злоумышленника проексплуатировать существующую уязвимость. Burp Intruder не достаточно для качественного пентеста. In recent research, we discovered multiple critical vulnerabilities in home, business and industrial collaborative robots from well-known vendors. With responsible disclosure now completed, its time to reveal all the technical details, threats, and how attackers can compromise different robot ecosystem components with practical exploits. Demos will showcase different exploitation scenarios that involve cyber espionage, harmful insider threats, property damage, and more. Attention! To take part in the workshop you have to register first! Registration: https://goo.gl/forms/VoaXdmL450Usj5QR2. Penetration testers as well as criminals are really good in breaking legacy and vulnerable IT components, apps, getting a reverse shell on the server and think that they won a battle. But, often they stuck and in many cases are easily detected and blocked, because of lack skill-set and knowledge about latest protection techniques and tools. Not always, but often. And often the reason of successful defense is the right combination of people skills, response processes, and simple tools. So we want to help you practice in modern Incident detection and Response. During this workshop we allows our students to hack organization with a common architecture, infect hosts with ransomware and run few exploits to get privileged access, establish persistence and clean-up to cover our tracks. Then we will let them hunt down for logs collected to SIEM. You will feel how it is to be a SOC Analyst, utilizing Splunk as SIEM tool, it's best tips and tricks, using open-source and commercial defense arsenal and trying to meet 30 min initial incident detection and response SLA. Also during next exercises, we will practice automation for Adaptive response and divide on red and blue team play more games to polish both - offense and defense techniques & tactics. Hiring a professional red team for security audits is not enough for finding the most critical vulnerabilities. A good level of collaboration between pentesters, company’s blue team, developers, managers is required in order to make this process efficient for both sides. Achieving it requires good planning, preparatory work, continuous improvement and a good understanding of the desired outcomes. This talk will evaluate goals, methods and typical tasks of red and blue teamers in a white-box application security audits and offer practical solutions for the most efficient collaboration of both parties. Hacking Quiz will be held in Russian. Hacking Quiz – это командная викторина, которая чем-то похожая на игры "Что? Где? Когда?" и "Брейн-Ринг". Вас ждут 6 увлекательных раундов с текстовыми и медиа-вопросами на около-хакерскую тематику. Вам понадобятся знания из разных сфер информационной безопасности и умение логически мыслить. Объединяйтесь в команды составом не более 6 человек. Если у вас нет команды, всё равно регистрируйтесь и мы сформируем её случайным образом. Mentor/Mentee session is a social event within the NoNameCon conference, inspired by the session of the same name at BruCon 0x9 in 2017. During the event, which will take place in the venue courtyard, participants will be provided with a choice of sticker identifying them either as a “n00b” or a “l33t”. Mentors (or "l33ts") are more experienced professionals who are willing to share their professional or career advice with younger colleagues – Mentees (or “n00bs”). Whatever role you choose, we expect this to be a great opportunity to exchange your unique experience, build new professional relationships, and have lots of fun. Mentor/Mentee session is sponsored and organized by Berezha Security. Threat Intelligence particularities world-wide. Real life use-cases. This talk will give a definition of “Threat Intelligence”, explain Threat Intelligence Cycle and how collection and research efforts should be prioritized. Then we’ll talk on what’s common and what’s different based on the region in understanding on what exactly Threat Intelligence should deliver. Speaker is going to demonstrate couple real life use-cases on how threat intel discoveries enhanced security capabilities of organizations or launched investigations to remediate the threat. Please see below couple use case that I will cover. DOC exploit builder identification within underground, was proven to be used by one of sophisticated fincrime groups in their operations as an initial vector of getting into victims’ environment. Knowing exactly which vulnerabilities should be prioritized for patching will help organizations in this threat mitigation. Will give an example of web-injects development to show the targeting of financial institutions in countries outside of TOP-regions that are under attack. Being aware of the exact timeline, and the fact it was developed and available will indicate the need of financial institution to enhance their defense practices such as incorporating 2FA, raising awareness of its customers, etc. Overview of incorporation of a newer exploit by one of notorious APT-groups targeting US, Western and Eastern Europe, recommendation will be in proper patch management. Examples of access to infrastructure or database of your organization is being offered at cybercriminal underground, first of all organization should develop their own capabilities or have a CTI provider to be timely aware about this fact, also additional information on TTPs used to gain an unauthorized access reveal what actions should be done to minimize chances for compromise going forward. A typical scenario of implementing security within infrastructures and software products looks fairly simple (and sad): just slap a few pieces of software and practices together from the ever-changing landscape of common wisdom, close your eyes and hope for good. What do typical consumers of security products and services miss when looking for solutions? What do we, as people who solve security problems, do wrong? Official NoNameCon press-conference. Speakers and Partner representatives will be invited to answer the questions of attendees and journalists. Доклад на основе кейса digital forensics компании RMRF Technology. Описание подачи заявки на выполнение forensic-анализа. Постановка задачи и описание инцидента, предоставленные клиентом. Удаленная диагностика для сбора дополнительных доказательств. Сбор доказательств, включая дампы памяти и диска. Идентификация инструментов, используемых для внедренного RAT-агента. Определение способа компрометации по SSH-ключам. Подготовка таймлайна установленных событий и финального отчета. Логика взлома будет представлена на докладе.